Banding took place this morning with a little bit of excitement. The chicks were heard scratching at the hatch door while it was still closed. When we exited onto the ledge, we found both chicks nearby, hunkering under the light fixtures. The male of the pair was not present at this time and is presumed to have been away hunting. 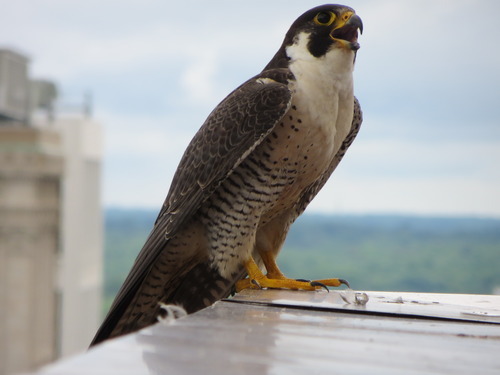 The adult female, however, was as aggressive as ever, landing on the ledge parapet as she has done in the past and even coming down on the walkway. The chicks were captured and secured inside the building, and assembly of the pen began. The male, returned from the hunt and clutching prey, joined the female in defending the nest site. He circled aggressively and released the prey, a chimney swift, nearly striking a biologist with it. In the meantime, a second team of biologists set about banding and measuring the chicks. We confirmed both chicks to be females. 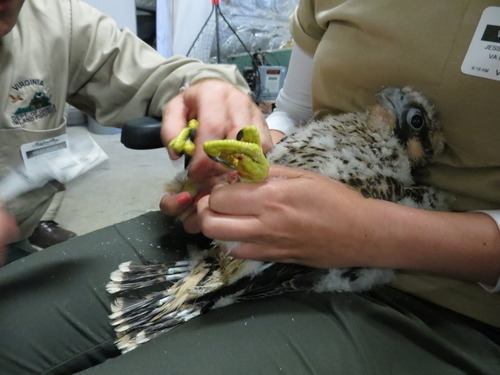 While preparing to band the second chick, we noted an apparent weakness in its right talon. As a precautionary measure, the chick was taken for evaluation to a local veterinarian with wildlife experience, while her sibling was returned to the pen. The vet noted that the bird was able to grip strongly with both of its talons and that it did not appear to have any problems. We returned the chick to the building, where she joined her sister inside the pen. Unfortunately an issue with a band prevented us from banding this chick today. However, we plan to band her in a few weeks on the day that we release the chicks from the pen.